The Programme of events for the 2018 Northern Ireland human Rights festival has now been launched. With over 40 events from the 9 - 15 December the festival programme offers a unique insight to human rights issues from home and abroad and is an attempt to promote the celebration and protection of human rights. Posted on November 20, 2018 by Kevin Hanratty. Do unionists and nationalists have different conceptions of what are human rights? As so often before, we are at a crucial time for the safeguarding of human rights in Northern Ireland. The talks for the re-establishment of the Assembly seem to have foundered on, amongst other issues, the degree to which the rights of Irish language speakers and of gay people who wish to marry need to be protected. There also continues to be something of a rift between local politicians as to what it means to say that a human rights approach should determine how the past must be dealt with in Northern Ireland. Although human rights are meant to be for everyone – universal – is it indeed true that unionists and nationalists define human rights in different ways? Or do they just have different views as to how absolute those rights should be? Do they agree that killing someone is, and always has been, a violation of human rights? Do the politicians think that Brexit will make a material difference to the human rights currently protected by Council of Europe treaties such as the European Convention on Human Rights? If there are arguments for and against the various views, how can they best be reconciled? Would a Bill of Rights help or hinder that reconciliation? Is there a realistic chance that the Assembly, if it were up and running again, could agree on human rights and equality legislation to supplement, or replace, the Human Rights Act, which the Conservative Party seems determined to repeal if it is still in power after the next general election? This event will begin with a short presentation from an international expert on conflict resolution who has just published a book on the extent to which human rights have featured in the politics of Northern Ireland since 1921. He will be followed by equally short presentations from local politicians and activists with clear views on when and how human rights should be protected. There will then be 45 minutes or so for a Q&A and discussion with members of the audience. Posted on December 5, 2017 by Kevin Hanratty. 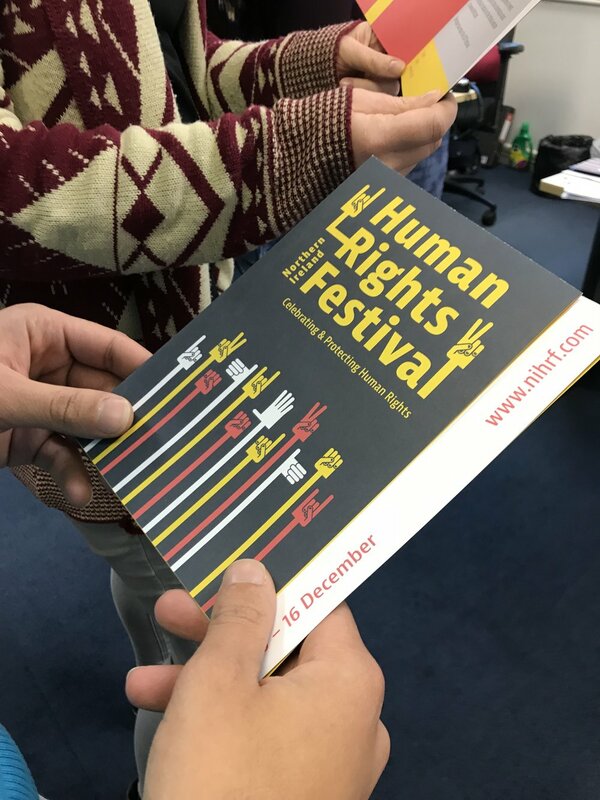 The 2017 programme for the Northern Ireland Human Rights Festival has now been launched is available to view in the events section of the NIHRF website at www.nihrf.com. This years festival which runs from the 10 - 16 December is again jam packed with events and activities that promote the concepts of celebrating and protecting human rights at home and abroad. As ever the festival is a collaboration between the Human Rights Consortium and numerous civil society organisations, academic institutions, charities, trade unions and public authorities to deliver a week of human rights events for the public to explore. Speaking on the launch of the festival programme Director of the Human Rights Consortium Kevin Hanratty said, 'We are delighted to launch the sixth annual Northern Ireland Human Rights Festival today. The programme as ever has a lot to offer in terms of education, debate and entertainment about human rights. This year our programme has gone fully online at the festival website but the public can still pick up one of our festival leaflets which have the key details of the festival and four unique posters to collect and display. Again this year we are very proud of the programme of events on offer and this wouldn't have been possible with the event contributions of the host organisations involved and the support of the Northern Ireland Human Rights Commission this year. Posted on November 28, 2017 by Kevin Hanratty. NIHRF 2016 has been and gone with a bang, with the festival being a runaway success. With increased events, audiences and reach, the festival is well and truly one of the essential fixtures on the festival calendar in Northern Ireland. We're hitting the ground running and want to hear from you about your experience during NIHRF 2016. We have drawn up a short survey which will help us to increase the festival experience for our audience. It allows you to have your say on the NIHRF, so that we can provide you with an even more amazing experience at NIHRF 2017. And because we're so awesome and generous, the survey gives you the chance to win a £30 book voucher for No Alibis bookshop on Botanic Avenue! Posted on January 16, 2017 by Kevin Hanratty and tagged nihrf. What does Freedom of Assembly mean in NI? As part of the 2015 Northern Ireland Human Rights Festival programme, a panel discussion was held looking at Article 11 (Freedom of Peaceful Assembly) of the Human Rights Act & European Convention on Human Rights and its current and potential impact on dealing with parading in Northern Ireland. You can listen to the entire discussion above by clicking on the play button. This event laid bare the many facets of the contentious issue of parading in Northern Ireland, as well as the important role that Article 11 of the European Convention on Human Rights (and the Human Rights Act), Freedom of Assembly has played, and will continue to play in providing a platform for the resolution of competing rights in relation to parading. The Orange Order’s Mervyn Gibson called for a new system to be implemented in relation to disputes over Article 11 and competing human rights. He said the Order wanted something that placed dialogue at its heart, with arbitration as a last resort rather than a first resort. Voicing his dissatisfaction at the Parades Commission, he said unionists needed a system that they could buy into. PSNI representative Superintendent Tim Mears has had a wealth of experience in dealing with the challenges associated with parading and the balancing of competing rights which has been characteristic of the dispute. He cited the biggest challenge for policing around Article 11 is the partial perspectives brought by the different groups who feel their rights have been engaged or interfered with. He called for a more universal understanding of Article 11, tied in with Article 9 Freedom of Expression as a step towards a society that respects the rights of others. Neil Jarman talked about the importance of using Article 11 whenever we have to deal with disputes regarding parades. He called it the ‘benchmark’ from which we have to think about disputes and tensions over parading here. In relation to calls for the dismantling of the Parades Commission, he said that any new body would still be grounded in the Convention. CAJ’s Brian Gormally argued that a human rights based approach was necessary to resolving disputes around parading. Outlining the human rights tests for conflicting rights, he argued that any discussion about parading could not be had without considering the value basis of human rights. Comments from the panel provided much food for thought, giving insights into the different perspectives around parading and how Article 11 is engaged in order to provide resolution. It has been a window into how thing may develop in relation to the arbitration and facilitation of contentious parades and the balancing of competing rights. Posted on August 23, 2016 by Jason McKeown. Well, that was fast. But we're ready to do it again this year, bigger and better! It's hard to believe it but we're opening up our call-out for events at this year's Northern Ireland Human Rights Festival. Every year an ever increasing number of organisations submit ideas that present human rights in more imaginative, innovative and creative ways. This year we want to continue that trend and build upon the great work that has been done in previous festivals. If your organisation is interested in being a part of this year's programme, then you can have a look at the criteria and download the application form in our Get Involved section. The deadline for applications is Monday 29 September, so please be sure to get yours in in good time. If you're interested in holding an event, but want to bounce some ideas around, get the creative juices flowing or talk to one of the festival team about an event; why not come along to our NIHRF Festival Surgery? It will be held on Wednesday 31 August, in the Green Room at the Black Box. It will run from 11 - 12.30, so please bring all your big ideas and aspirations! Posted on August 17, 2016 by Jason McKeown and tagged nihrf 2016 festival human rights rights poetry comedy music event application surgery. The Ulster Covenant and Easter Proclamation represent important historical and constitutional texts in our shared history. This event explored the human rights elements and meaning within the two documents. Local historian Philip Orr examined the Ulster Covenant, signed in 1912. Setting out the fractious context which saw the development of the document, he explained that its author Thomas Sinclair was a Liberal, and that this shone through in the text. He highlighted the Covenant as a very public document, one that engages the idea of female and universal suffrage and the need to create a wider voting franchise. Orr underlined mentions of conscience, equal citizenship, and fears that religious freedom would be undermined by Home Rule as evidence that rights and equality were a core feature of the document. Sinn Fein MLA Chris Hazzard looked at the Easter Proclamation from 1916. He focused on how equality was very much at the heart of the document, with issues of democracy, self-determination, sovereignty, economic and social justice and the rights of all citizens regardless of religious persuasion or none. He added that the signatories had envisaged a system of representative government, which meant universal inclusivity, including suffrage for women and their participation within government. While grounded in the context of the competing perspectives on nationality and the future governance of Ireland the event brought into focus some of the historic aspirations behind both document for more progressive societies which extended the reach of rights and equality. Posted on August 9, 2016 by Jason McKeown. The week zoomed by on another Northern Ireland Human Rights Festival with over 40 events that made this our biggest, loudest and most exciting programme to date. The festival as a whole brought to prominence a wide spectrum of human rights issues whilst providing food for thought and discussion. Events were delivered through an extensive range of mediums. Film, comedy, spoken word, music, panel talks, debate and exhibitions were all platforms that provided an opportunity for conversation and debate around the multi-faceted world of equality and human rights. A clear highlight was the Refugee Welcome Party on our closing day. A packed crowd turned out, stood up and made it known that refugees and asylum seekers can be a part of Belfast, that we will bring them into our communities with open arms and in doing so, send a message that as ever a tiny backward-thinking minority does not speak for a tolerant majority in Northern Ireland. If lots of music, happy faces (young and old), laughter and buckets of entertainment are indications of success then this was probably one of the most successful and rewarding events that we have held over the four year history of the festival. It will certainly take some topping next year. The Refugee Welcome Party was a cacophony of colour, community and cheerfulness, a roaring embrace to those refugees and asylum seekers who have come to Northern Ireland and a positive signal to those who have just arrived and those who will come in the future. The NIHRF set about the task of bringing human rights to new and broader audiences. This action-packed week has shown that there is an appetite and an enthusiasm for the celebration and protection of human rights, something which we look forward to building on and progressing in coming years. Over the coming weeks we hope to pull together some of the festival highlights in a series of reviews, posts and podcasts so keep an eye out for further updates on the website and social media. If you attended the festival and have any event comments or photographs that you would like to share then please forward them to us through the NIHRF website or social media. Posted on January 8, 2016 by Kevin Hanratty. We’re looking for enthusiastic and hard-working volunteers to help ensure the smooth running of events which have been organised by the NIHRF. Volunteers will enjoy a hands-on experience in a number of different human rights events. It will provide an opportunity to further your knowledge and interest in the field of human rights and it’s a great cause to get involved in. No previous experience will be necessary as volunteers will be provided with an information and training session in advance of their participation. Anyone who wishes to register their interest in volunteering is asked to contact us on 028 90313780 or at info@humanrightsfestivalni.com. Posted on November 25, 2015 by Kevin Hanratty. The programme for the 2015 Northern Ireland Human Rights Festival has landed! On Thursday 5 November a full house in The Black Box got the first glimpse at the action-packed line-up for this year’s festival. From poetry and comedy to panel discussions and lectures via films, music and exhibitions, the breadth and diversity of events in our 4th NIHRF means it’s our most ambitious one yet. This year it will run from Sunday 6 to Saturday 12 December. The launch provided the perfect opportunity to highlight some of the wide-range of human rights issues from both home and abroad that are explored in this year’s NIHRF. The Refugee Welcome Party and Family Day on Saturday 12 December is a great way to extend the hand of friendship and greet those who have had to leave their own countries and communities. Hollie McNish will return to Belfast to wow us all with her compelling brand of poetry. The 2009 UK Slam Poetry champion will take to the Sunflower Bar on Tuesday 8 December, supported by some of Belfast’s finest talent. Comedy with a message will come in the form of performances by Mae Martin on Wednesday 9 December and Aiden Killian on Friday 11 December, with both showcasing their talents in the Sunflower Bar. Colin Hassard, whose powerful rendition of his poem ‘Foreign’ brought a fitting end to the launch will be the Poet in Residence for the festival, appearing at venues throughout and headlining the From A Republic of Conscience event on Thursday 10 December. With the Human Rights Act currently under threat, a panel discussion on the impact of the HRA in Northern Ireland will hear from academia, political and civil society spheres will provide food for thought. There are many, many more fascinating and engaging events which make up this year’s NIHRF and they can be viewed by either picking up a programme from venues throughout Belfast or by visiting the NIHRF website. All of the events are open to the public, most are free and those which require bookings can be accessed on our website. Posted on November 19, 2015 by Kevin Hanratty.